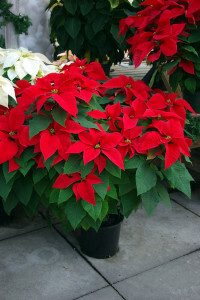 Large size poinsettias are increasingly important. While any size of large pot can be used, they are typically grown in 8 to 10 in. pots, normally with 2 to 3 cuttings/pot for 8-in. pots and 3 to 4 cuttings/pot for 10-in. pots. Medium to high vigor cultivars should be used. The cuttings are stuck and pinched two to three weeks before the plants in 6 ½ in. pots. Some low vigor cultivars can be used if they have large bracts and an extra two weeks are added to the large size schedule. Plants can also be grown without pinching for dramatically different plants. 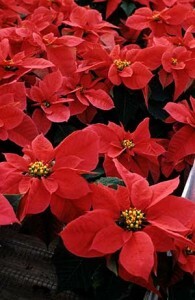 Prices will need to be higher to account for the extra cuttings required. An 8-in. pot should have 3 to 5 cuttings and a 10-in. pot 5 to 8 cuttings. Cuttings are planted two to three weeks later than plants that are pinched to get the same size. While only a few growers produce their own cuttings, stock plants can also be used to produce large size plants. Keep in mind that the goal of stock plants is to produce large number of cuttings, but all of those shoots result in many poorly formed bract clusters and unattractive plants. When flowering stock plants be sure to vigorously prune and shape the crown and thin the shoots. Leave only a few strong shoots.